Another new name from the bad seller on Ebay (and elsewhere?) inspectorgadget0481 / tomthetoolman818 / machineheadtt / pamlovespatagonianpancakes. Sells fake Beatlegs now as "heyjudejack". For the whole story see my entry under the topic "inspectorgadget0481 / tomthetoolman818 / machineheadtt". To remember: seller sells intentional fake Beatlegs as "original Yellow Dog" and wrote for ex: "Yellow Dog is one of the most famous and collectable Beatleg Labels available" or "Beware of fakes being sold elsewhere and on eBay". After I wanted my money back he told me, that this is not possible and "description was 100% accurate with no misrepresentation whatsoever". After I called in Paypal, he still wasn't willing to pay me back the money. At the end, Paypal gave me back the money. After I gave the seller a negative feedback he replicated that he made no mistake at all. "Do I really deserve to be put in Hall of Shame on Bootlegzone? I sold some fake YDs for some time. I was selling them for a friend of mine. Those were not my CDs. I made some mistakes. I have not made the same mistake again since then. All of the items I'm selling now are original. You have only been collecting for a year. I have been collecting for more than 15 years. How can you say you know originals from fakes? There are bad sellers out there who are manufacturing junk in large scale. There are selling them on multiple accounts. All homemade. Those are the bad sellers, not me. You bought some fake items from me. You returned them and I gave you a full refund. What more should I do? I do not deserve to be hassled with multiple negative posts that have even revealed my name. How would you like if someone did that to you? If there is anything I can do for you, let me know. Otherwise the issue is done." 1) Yes. Selling fake CDs as originals deserve to be put in Hall of Shame. 2) In 3 month I bought 3 fake CDs from this seller - what a fortune all of them are "fakes from your friend". And by the way - why are you selling fakes, even if they should be from your friend. You sold fake Beatlegs voluntary and after I "catch" you you deny everything. I made a mistake and I am sorry. I do not deserve to be harassed for all eternity. Even now I can refund you for all that you say. Is the issue about money??? I don't care for money. My good name and integrity means more to me. What you are saying has no merit. “I do not believe you if you are telling me "I have not make the same mistake again" - feedback under your account on Ebay (pamlovespatagonianpancakes) says sth. else. The negative feedback was for a totally different reason. I do not need to go about explaining myself. But if that’s what it requires I will. Actually the feedback will not be blocked because I was not at fault. If you are so unsure contact that buyer. Besides I have nothing to hide. Are you a "serious Beatleg collector"?? If so, you will see all the items I have are original. But you do not have to take my word for it. Please consult BZ, moptop, etc. That's what a smart collector would do instead of just talking. BZ is a place for people to share and discuss collecting, not a place to badger people who really do not deserve it. I can help resolve the issue if you are willing. If you choose to continue to rant about this I cannot stop you. But you will not get anything out of it. I can assure you that. Your good name and integrity? 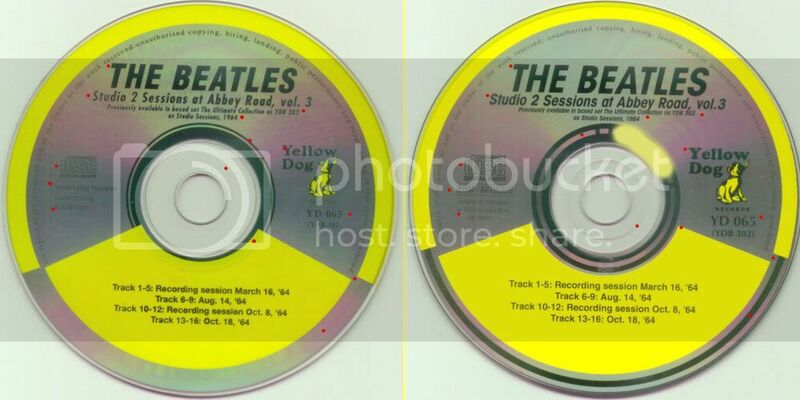 Selling for example the CD "The Beatles - Studio 2 Sessions at Abbey Road" with the matrix "YD 066" (should be "VTCD YDB302") as an original Yellow Dog CD represend your "good name and integrity" as a collector for more than 15 years? After I contacted you, you refused to pay me back my money - is this represend your good name and integrity? After I contacted Paypal and Ebay, you still refused any repayment - is this represend your good name and integrity? After I wrote a negative feedback, you institue a process on Ebay to delete my feedback - is this represend your good name and integrity? After Ebay rejected your suggestion, you blocked the access to all the feedbacks on your account tomthetoolman818 - you have nothing to hide? The negative feedback under your accont "pamlovespatagonianpancakes" was "for a totally different reason? The feedback says "selling fake" - yes, this must be a totally different reason! And no. The issue is not any more about money. It is just about warnig all other serious collectors. To say "I am sorry" after 7 month and after you realized that you are on the "Hall of Shame" is to late and dishonest. Actually, no. I was obligated to refund you then. You left negative feedback within less then 24 hours. I never made the suggestion to them. You have joined BZ just to post these comments, for no other reason. You are not an experienced eBayer or collector. I take everything what you say with a grain. Others can judge the facts and decide for them self. You still need to educate yourself quite a bit before posting these types of comments. Serious collectors will not budge to sell to you. You are cut throat and impossible to work with. Take care, my friend. Good luck to you. There's nothing more to discuss. You have joined BZ just to post these comments, for no other reason. I don't know who is right and who is wrong here, but that post is a joke coming from a guy with 12 posts. He joined just to complain, you joined just to retort. Did you use a compass to get out of this place? Well, I joined in 2006. I did not join BZ for this reason. I've been always referring to this forum for information and reference, not to deal with this. If there is some disagreement, I would hope it should be for the purpose of some resolution or some outcome that is fair for both parties. This, I think, is going nowhere and is totally pointless. I don't know what Embe74 wants, probably my blood. Bootleg recordings are against the rules to sell on Ebay. It's listed under Rules about intellectual property – overview. Regardless of how the sale went down, Embe74 can report the rules violations by the seller. I understand what you are saying but this is not what Embe74 is complaining about. Embe74 is buying bootlegs just the same. That's not the reason for his post. But I do take you point.Thanks. Yep, two wrongs don't make a right. You are just very bold and you are saiing again not the truth. OF COURSE you tried to delete my negative feedback via a request to Ebay. I STILL HAVE the e-mail from Ebay! "Das Mitglied tomthetoolman818 fordert Sie auf, die ursprüngliche Bewertung, die Sie für The Beatles - Studio 2 Sessions At Abbey Road Vol. 3 Yellow Dog CD (170728667198) abgegeben haben, zu bearbeiten.Dieser Antrag bleibt bis zum 8-Dezember-2011 offen. Bitte reagieren Sie auf den Antrag, indem Sie auf Anfrage akzeptieren oder Anfrage ablehnen klicken." And OF COURSE you trie to hide your fraud. Your old account (tomthehoolman818) is not online any more. You "changed" the name of this account into "nygiantsno12012deletedaccount54545431". Nobody can read the feedbacks any more. On the site "http://feedback.ebay.ch/ws/eBayISAPI.dll?ViewFeedback2&userid=nygiantsno12012deletedaccount54545431&_trksid=p3984.m1439.l2776" you can just see that you get 2 negative feedbacks (this are the once from me to you). The fact is just, that you selling fake Beatlegs. Just in my case you sold me 3 fake CDs (2x 20. Nov. 2011 and 1x 5. Sept. 2011) - KNOWINGLY, NOT BY ACCIDENT. In your offer, you wrote that you CDs are ORIGINAL YELLOW DOG CDS and "Beware of fakes being sold elsewhere and on eBay" or "Yellow Dog is one of the most famous and collectable Beatleg Labels available" or "GUARANTEED ORIGINAL AND IN MINT CONDITION" etc. AND you refered to this site (bootlegzone) BUT YOU DIDN'T SHOW THE MATRIX NUMBER OR SPECIFY THE MATRIX NUMBER! My first mail to you was the following: "I bought 2 CDs from you. The Beatles - Studio 2 Sessions at Abbey Road vol. 3 and 4. Both are fuzzy fakes. Very Disappointing. The Matrix on your fake CD is for example YD 066 but should be VTCD YDB302. Very naughtily to write in your e-bay offers "Beware of fakes being sold elsewhere" but selling fakes - knowingly". And I gave you the possibility to pay back the money. Your answer: "Hello. I'm sorry to hear that. My listing was accurate and I included close up photos of the actual items. These are silver CDs and matrix #s were noted in the auction description. This should have cleared up any confusion or doubts. I'm afraid I cannot offer any return." Then I wrote again to you: "After you have selling me 2 fake CDs I have check the other CDs I have bought from you (your other ebay-name is inspectorgadcet0481). And you also have selling me there a fake CD (Alf together now - half japanese fake with orig. CD but recreated fake artwork). " And also in this case I gave you the opportunity to pay back the money. Your short answer: "Hello. This transaction was 4 and half months ago! It should have been addressed then. I cannot do anything about it now. Sorry." After that I wrote to you: "Ok. I see, you are not an honest seller. You wrote in your offer,that publisher is yellow dog records but this is not true. You wrote "Beware of fakes being sold elsewhere and on eBay" but actually selling fakes. And no, you didn't wrote the matrix-number and you can't see the number on your pictures. But I know it makes no sense to lead a discussion so I have to turn to Ebay/Paypal." And just in this moment and after the fact he was not willing to pay back the money I wrote a negative feedback. Your answer: "Hello. I am an honest seller. I agree the matrix was not clear in the photo. If you were unsure, why didn't you question it? Now you have left negative feedback so soon before even proceeding with the dispute. I am not willing to help you or resolve the issue anymore. Ebay/PayPal will decide now. And another answer from you (after Paypal protected my view): "(...) I believe I am a fair seller. If I am at fault I have no problem compensating for my mistake. Whatever you think about the items, fake/not fake..it's okay (...)I will not continue haggling with you. All this is not necessary. I would kindly request that we mutually withdraw the feedback. Leaving negative feedback when you have not even proceeded with PayPal dispute or waited for any further communication will not help you in the long run. As a professional seller I would want to deal with this amicably. 7 Month after all this you wrote me again: "Do I really deserve to be put in Hall of Shame on Bootlegzone? I sold some fake YDs for some time. I was selling them for a friend of mine. Those were not my CDs. I made some mistakes.(...)" In other words. In my country, your behavior is a fraud, a offense. I am surprised that you try know to talk about why I joined this page. I consult this page since a long time - even if I didn't write any comments. I have around 150 Beatlegs. I love Beatlegs. And I wrote this lines about you to protect other lovers of Beatlegs. They shouldn't pay 40 or 50 Dollars for one Beatleg CD and getting a fake from you! There would be an other possibility: saying nothing and don't care if others buy fake CDs from you. But I thing THIS would be not fair for all other people which love Beatlegs as much as I do. What is a joke? My poor english? Yes, you are right. Or is it a joke that I share my bad experience with all of you? I think, this is important to protect other "beatleg-lovers". I think, everybody should help other people in this matter. That is why a topic like "hall of shame" exists. Helping each other and warning each other. I can't see any joke in warning other people and I am surprised about your statement. And even if I am just writing one article in this section (what is not true - see my other posts like about the Paul McCartney Concert in Zürich or about "yellow chatter custard" or "must have beatleg" etc. ), what is wrong about that? You would prefer that I am calm? What's better in that case? Actually I was addressing the other guy (see the quote?). My hunch is that you are the one telling the truth. Hmm, okay. I see you are right. You joined BZ to ask about the matrix # of the fake YDs. Then you post about me. Alright, my bad. What you are saying, Embe74, is 100% true. I don't deny that. I made a mistake, I accepted, apologized and have not repeated it or ever will. But the extent to which you are taking this is far beyond reasonable. Many people are guilty of the mistake I made, but they are still continuing without recourse. I am simply being targeted by a cut throat buyer like you. What about Peter Sellers Tape which you left positive feedback for? Is that a dishonest seller. I sent this email to you on May 2nd which you did not respond to: This was sent even before I saw your post on BZ. I know that probably I am very late for this, but I wanted to apologize for the mistake I made by selling the fuzzy fake Yellow Dog CDs with wrong matrix numbers. I admit that. It was very wrong on my part and I feel badly about it. I may not always do the right thing, but I know the difference between right and wrong. I believe that I am an honest seller with good intentions. I will not sell those misspressed Yellow Dog CDs anymore. I was selling them for a friend and just wanted to get rid of them. I know they are not suitable for serious collectors. Some people that are Beatles fans just care about the music and want a decent copy. I am very sorry that I mislead you. I will not do this anymore. The items that I continue to sell are authentic and I know that. If you think otherwise please inform. This probably won't make any difference, but I would like to refund you for the Alf Together Now CD that I sold some time back. I know it doesn't do any good. The mistake is already made, but I hope it will make things a little better. Please let me know what you think. The fact that I sent fake items and you were not happy was a little bothersome for me and I want to make some attempt at resolution. Please reply and let me know. I made a mistake. I admit. That doesn't mean I am a dishonest person. People do wrong things in their life. They learn from them and move on. What's more important is that they don't do it again. Hello. I'm sorry to hear that. My listing was accurate and I included close up photos of the actual items. These are silver CDs and matrix #s were noted in the auction description. This should have cleared up any confusion or doubts. I'm afraid I cannot offer any returns. If you would like to return the CDs, I can possibly offer a refund. I'm sorry you are unhappy with items. Please let me know what you would like to do. Thank you. Is it your bad English that did not catch this part of the message? I was under the impression that you wanted to keep the item and still be refunded. My listing was wrong. But the photos were correct even though a bad item. Lastly, is this considered a fake?? It is confusing if this is considered a reissue or what. I mean I have this in my personal collection, but I don't know. This is one of the items that Embe74 is complaining about. The 2 YDs, I know, are not real. But the Alf Together is confusing. Any comments? I don't know what more I should do if I have to be ridiculed on this forum. It is my understanding that Hall of Shame is for people to complain about being cheated by people who got away with it who are still cheating. I offer resolution. Embe74 doesn't want it. What should I do here? I am open to any feedback or suggestions. My hunch is that you are the one telling the truth. Embe74 is telling the truth. But I am also. Otherwise, I would not bother to reply to this topic. Show me the fakes that I am selling now that make me deserve me to be put in Hall of Shame. I'd be interested to see what you come up with. This topic is totally unacceptable to BZ. Embe74 is complaining about buying buying "fake" Beatlegs. I am saying "original" Beatlegs and past is past. Selling Beatlegs is wrong as long as they are original Beatlegs??? Buying Beatlegs is okay??? SELLING AND BUYING BEATLEGS IS WRONG, ORIGINAL/FAKE DOES NOT MATTER. We are 2 hypocrites beating a dead horse. Yes, you wrote me this: "Hello. I'm sorry to hear that. My listing was accurate and I included close up photos of the actual items. These are silver CDs and matrix #s were noted in the auction description. This should have cleared up any confusion or doubts. I'm afraid I cannot offer any returns. If you would like to return the CDs, I can possibly offer a refund. I'm sorry you are unhappy with items. Please let me know what you would like to do. Thank you." But you know what? It is full of lies. 1) listenig was not accurate 2) no, matrix was not noted at all 3) your pics doesn't show the matrix (the back side of the CD). And to say "I am afraid I cannot offer any returns" or "possibly I can..." (or I can not?) is not enough. And to your e-mail from May 2nd: you wrote this half a year after I bought the CDs, half a year after I wrote you the first time, half a year after we had the dispute via Paypal/Ebay and after I get the money finaly by Paypal. First mind after I get this e-mail from you was: ah, he found out that I wrote a negative feedback on "BootlegZone". And voila, short time after this e-mail I got an other one with this beginning: "Do I really deserve to be put in Hall of Shame on Bootlegzone? (...)"
But what should I say more? I think your last statement says everything. For you, it does not matter if the CDs are original or fake. I regular follow this particular ebay seller and it is only geography that stops me buying from him. The titles for sale are well documented with images and there a regularly links to Moptop's and/or the Vigotone fan site which shows details of the variations available. I can not with all honesty say whether links were made to the KTS jewel releases. But many buyers don't care whether they are Genuine Yellow Dogs or KTS Fakes as long as the music is cloned. The KTS FAKE Yellow Dog Digipaks remain as popular as ever. so there is no need to rely upon the matrix numbers. I can't recall any discuss of YD fakes until I started grumbling about a badly mastered copy and no one discussed the Fuzzy Misterclaudels until I shouted about them. Pirating of Bootlegs has been happening since the second Beatleg and I can't see that it is going to stop. I would prefer to see sellers put up as much info as they can and let the buyer ask questions if needed rather than a generic or library images and the buyer having to ask 101 questions. I am always happy to help identifying variations if any one, buyers or sellers needs any help. I am very good at saying 'no idea' if I don't know , so don't worry about receiving any BS. Thank you for your post, Chris. But you know what? It is full of lies. 1) listing was not accurate 2) no, matrix was not noted at all 3) your pics doesn't show the matrix (the back side of the CD). And to say "I am afraid I cannot offer any returns" or "possibly I can..." (or I can not?) is not enough. The photo was of the actual item. The listing description had discrepancies. And you are right a catalog # was noted but, no actual matrix #. Most listings on eBay do not even mention matrix #s or close up photos/scans. I have to bug sellers to provide this info when buying. I try to include this in my listings though. I definitely gave a mixed message by saying I will or will not refund. I see that. What Embe74 is saying about me is true. I'm not going to argue that. What's upsetting for me is that he chooses to give my personal information on the internet giving a false representation of who I am. If it weren't for that I would have no need for commenting here. Now ever time someone Googles my name this will turn up. It doesn't even matter if it's true or not. The fact that it's here creates enough damage for me. I believe that I am fair, honest, and reasonable seller and a person. At least I would hope and that I others feel the same. But if there is any problem I would be happy to work with you. Why not contact me directly, that is if you want something done about it....do you?? I don't think so. I think you are here just to rant because it does something for you. What, really I don't know. alfonso8211 .....Not a single feedback mentioning fakes. All of his items are from a fafos.com....A huge counterfeit wholesaler. I'm sure people here are aware of this. This guy, well it's not a guy...but a large organization based in Florida/South America They counterfeit everything even the latest Misterclaudels. Is he a good seller?? (obviosly not an original Silent Sea. He must be making these. This guy has several accounts. This guy is copying everything from Vigotones to Yellow Dogs. He must have the equipment to make these. He's selling multiple copies. But no negative feedback. I mean the discs look nice. The are CDRs. But they are fake and surely not cheap. http://cgi.ebay.com/ws/eBayISAPI.dll?Vi ... true&rt=nc[/url] Is this Strawberry?? http://cgi.ebay.com/ws/eBayISAPI.dll?ViewItem&_trksid=p4340.l2557&item=230808752108&nma=true&rt=nc&si=2RlBaWBNgYsxSkz8AMQgRhpCFl8%253D&orig_cvip=true&rt=nc A top rated seller?? Selling is not a job for me. I am a collector more than anything else. I have been selling a friend's collection for the past year. He doesn't have time. Included were official releases, boots, box sets, and fakes (not homemade, but silver and digipacks (KTS, a few Swingin' Pig Monadas, and such) Mostly originals though.....Many people don't care....I leave that up to the buyer. I don't sell the fake silvers anymore. It creates too many problems. I guess only if you're a collector you would care. But now after this whole thing I choose not to. Selling this stuff is bad regardless, I know. Embe74 is okay with buying bootlegs even if the sellers are a doing an illegal service for him which he admits. Is something wrong with this picture?? I'm buying drugs..that's okay......but the drug dealers whom I buy from....there the ones committing the crimes by selling to me??? I don't have anything to say about what Embe74 is posting about but that it's all true. That was my fault. I will not support myself on that. But why is it being taken to this level of animosity and bitterness even though I have enough regret and remorse to deal with? I don't have a problem with this stuff being posted but I just feel violated that my personal information has been posted on the internet. Are you going to post my address, phone #, email addresses for what I have done because of the bad experience you've had with me. Show me the fakes that I am selling now and have been selling that make me deserve me to be put in Hall of Shame. I'd be interested to see what you come up with. Usually people that sell fakes do it regularly and most often in quantity. Some even do it as a main occupation. My collection is insane. But that I mean if someone came into my home they would think something is seriously wrong with me. Two medium sized rooms of wall sized shelves. Music is a priority for me and a necessity. I cannot say that about anything else besides food, water, and shelter. I collect. I know this stuff. So I sell what I know, occasionally so I don't have to add water in my milk when I'm bleeding from collecting. That may be looked at as passion, but it's addiction. If I am lost on a deserted island, the Beatles discography would play in my head until the mental playlist would switch. I am a collector so I know where Embe74 is coming from. My morals may be challenged at times. I have made mistakes, but I do my best to correct them if at all possible. At least I have that insight. But this seems like it cannot be corrected anyhow according to Embe74, and this is the ultimate punishment. This is a nightmare for me. This would be a nightmare for any seller selling something to Embe74 regardless of what it is. I would like to know what people think about this. I have done my best in explaining things. Do you know what is the big big differenc between all the sellers you list on your last post and yourself? They sell fake Beatlegs for 20 Dollars BUT they do not say that they are originals. YOU are selling fakes for 40 or 50 Dollars and say, that they are 100% originals from Yellow Dog or "Beware of fakes being sold elsewhere". You even write, how high-range original Beatlegs are. THATS the big big difference. You say, that you are a collector for 15 years. You say, you are a professional seller in an other mail. And like moptop is saying correctly, there a regularly links to Moptop's and/or the Vigotone fan site (and others like BootlegZone) on your selling page on Ebay. In other words - you know exactly what is a fake and what is an original. You sold me for example this "The Beatles - Studio 2 Sessions at Abbey Road vol. 3 and 4*. The Matrix on your fake CD was YD 066 but should be VTCD YDB302. There is just one possibility to distinguish a fake from an original in this case clearly: you need the matrix number. And exactly this matrix number was not available on your infos but instead a lot of pics (without CD backside with the matrix) and infos like "100% original Yellow Dog CD". What made me angry the most is, that you didn't make a mistake by accident, because you do not know it better. You cheat knowingly. And after I noticed this, you deny everyting for weeks. Just 6-7 month later - and AFTER I wrote this negative feedbacks on BootlegZone - you change your attitude. To your question. I do not know if you are still selling fakes because I do not buy anymore CDs from you and can't check them. I just know, that I bought at least 3 Beatlegs from you between. 5. September 2011 and 20. November 2011 and all are fakes. I know that you have a lot of accounts on Ebay (5 or more). I know, that you block accounts with a negative feedback and I see that an other buyer wrote, that you are selling fakes (if this is true in his case or not, I don't know). Sorry Embe74, if the seller provided you the disc in the images , I can't see that it is fair to hang your hat on him not identifying the matrix number in the auction or his phrase "100% original Yellow Dog CD" if this appeared in the auction. ( I will write a separate message on what I consider what constitutes a FAKE.) If you thought the only way to identify a KTS pressing was to look at the matrix number, why did you not ask that specific question? My opinion is that there is a misunderstanding but not a case of a bad trader and the matter is one for closure. Last edited by moptop on Wed Jul 04, 2012 1:42 pm, edited 1 time in total. Post subject: KTS Jewel case dispute - what is a fake. This could easily become a flame war, which can only be a bad thing for our community. Both parties have expressed their opinions and anyone reading these can make up their own mind as to what has happened. I would like to say that I do not personally know either party and am happy to provide assistance to either as buyers or sellers. As one of the primary people identifying and using the term FAKE, I would like to clarify several points about this term. FAKE is a word that can have many meaning s when talking of beatlegs and maybe it is not the best word . I’ll use Yellow Dog and Vigotone titles as a guide as I have done the most research on these. So with the exception of the CDR reelase these are all factory pressed and therefore REAL not FAKE . The masterings for all but the 1st and DSL remake are different. But the content is the same. The DSL versions are open to dispute are they from Yellow Dog or Chapter 1 or both. The Rxx fakes were clearly mastered and pressed in Australia with different mastering and artwork variations. Some say sublicensed by YD other say pirate YD releases. The two KTS releases are clearly not Yellow Dog titles but as a Digipak , it is a FAKE Yellow Dog but it is easily identified as such therefore is it a FAKE. I’d say not Ok so what about the jewel case version clearly it is a pirate and is pretending to be something that it is not. But it provides the same audio and adequate artwork, I can’t recall any mention of it prior to the review BW and I undertook to identify all the variations. The Commercial CDR’s are either monochrome or bi-colour release which copy the YD model and being on on silver cdr are meant to fool the buyer and clearly FAKE. But looking at the other versions they may or may not be label FAKES ,but I would not consider them to be FAKE Beatlegs they are genuine releases and my opinion is that it would not be necessary to sell these as FAKES. Many people would be more than happy to own these, indeed I regularly see CDR Fakes sell for good money and a week later a pressed disc for less. I my opinion if fan/collector/ buyer is looking for a specific version they should ask the appropriate questions to identify what they are buying. If a seller answers any questions untruthfully that is a matter of a bad trader, but NOT identifying that an item is a FAKE label is in my opinion not especially with some dispute over which releases are fakes. BW and I decided that the KTS and Rxx jewel cases releases were FAKES , when we undertook our review, we made and make it clear that we have no evidence to support this. For all we know YD spoke to KTS or Turtle and requested that they pressed these versions. It was our personal decision at the time as to what we thought were non YD releases. Concerning this specific complaint. It appears that images of the actual disc for sale were made available and with so many identifying ways to identify the KTS issue , I feel that this is very much a misunderstanding rather than a deliberate attempt to mislead and time for the matter to be closed as a misunderstanding. I may even goes as far as request the complainant to withdraw the complaint and mods to delete. But I leave that to the two traders to decide. Sorry I couldn't wait . There are 14 points excluding the matrix to identify the KTS pressing. A dot on each shows what to look for . As a side you can not always rely upon the matrix number to identify genuine pressings. One of these two are a fake! Both have different masterings of the same title. I am really surprised about your statement. He is a professional seller which collects Beatlegs for 15 years. And then he sells a fake CD as an "original Yellow Dog" and wrote also: "Yellow Dog is one of the most famous and collectable Beatleg Labels available" or "Beware of fakes being sold elsewhere and on eBay". And after that you asking me "why did you not ask that specific question?" So the next time I will ask: "You are selling a CD as 100% original Yellow Dog. Is this a lie?" Why I didn't see the 14 other points? I don't know! 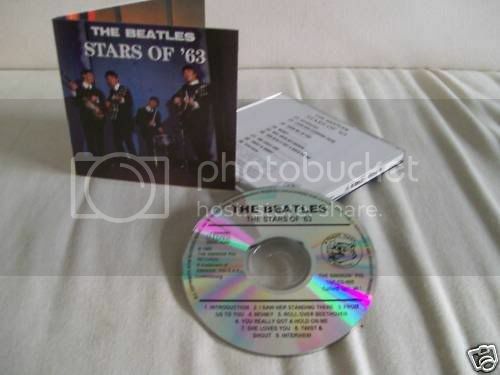 Maybe I was not experienced enough or he put a pic of an original CD on ebay and sent me a fake. I don't know. But do this matter if somebody with experience sells a fake CD as an original????? Do this matter if this person is not willing to compensate his mistake (or just after 7 month and after I wrote a negative feedback on BootlegZone)? I really do not understand you. Sorry you need to let this one go Embe74. The discs you received are from what you say what was for sale. Clearly they were KTS pressed discs. Whether they are YD's is a disputable issue , I believe not but I don't know. Many collectors do no accept the guide I wrote about identifying Yellow Dog releases. Others may not even know of the guide. New evidence may come to light and I may change my opinion . There was a Swingin' Pig release which I originally thought was a remaster. Evidence was then provided that suggested otherwise . I amended my opinion and guide, that does not make me a liar. My advice to you is that you need to establish what you wish to buy and ask the appropriate questions. The world of collectables is not black and white and not everyone has the same opinions, so you need to ask the right questions. The best way to do this is to be friendly an not confrontational. It is my opinion the way you are handling this is doing you more harm than the seller and it is time to put the matter to rest. Are you serious or is this seller your friend? This seller says, that he is a professional Beatleg seller. He says, that he collects Beatlegs since 15 years. He know all the internet pages about Beatlegs (also yours) where everybody can see the difference between a original and a fake Beatleg. So this seller sells fake Yellow Dog CD with the wrong matrix-number (for example YD 066) and says that this is a "100% original Yellow Dog CD", "Beware of fakes being sold elsewhere and on eBay" or "Yellow Dog is one of the most famous and collectable Beatleg Labels available". And you think, this was just a "misunderstanding? That is a joke right? By the way. This seller made the same thing many times. After I realized the wrong matrix (should be VTCD YDB302) I wrote him (including your moptop site where he can see what matrix the original CD has and what matrix a fake CD hat) that his CD is not an original Yellow Dog CD. His answer was just, that the discription was correct (remember: he wrote, that his CD is 100% original Yellow Dog CD) with no space for a missunderstanding. So do you really think this is still just a mistake by accident? 7 month later, this seller wrote (with the hope I would delete the negative feedback here): " I sold some fake YDs for some time. I was selling them for a friend of mine. Those were not my CDs. I made some mistakes.(...)" And you still think this was a misunderstandig and there is no black and white issue about this? No really, you must been joking!